President Recep Tayyip Erdoğan arrived in Athens on Thursday, marking the first official visit by a Turkish head of state to Greece in 65 years. 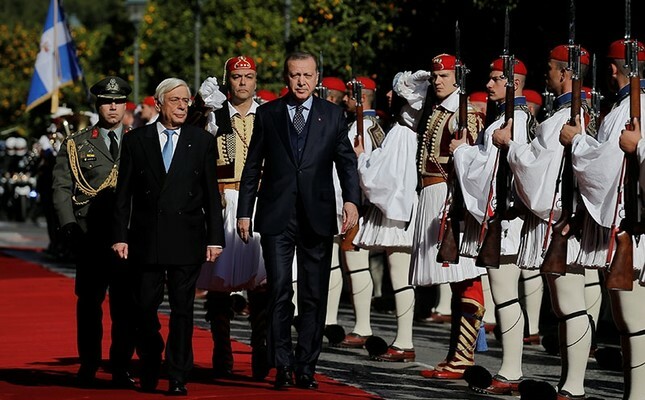 Speaking during televised talks with his Greek counterpart Prokopis Pavlopoulos, Erdoğan expressed hope that his visit will mark a new era in Turkish-Greek relations. In his speech, Erdoğan reiterated his call to revise the Treaty of Lausanne of 1923, citing the conditions of ethnic Turks living in Greece's West Thrace region. "Muslims in [Greece's] Western Thrace have not even been allowed to choose their own mufti from their community; efforts to appoint a mufti are ongoing, but this is not the case for the Patriarchate in Turkey," he said. "You cannot find any discrimination against Turkish citizens of Greek origin in Turkey. However, in the Western Thrace, even writing the word 'Turkish' is not allowed." Noting that the average income of Turks in the Western Thrace is $2,200, Erdoğan said: "Steps for investment and economic development have not been taken, for this reason the Lausanne Treaty should be updated." Pavlopoulos insisted, however, that the treaty was in need "neither of revision nor of updating." Touching upon the topic of Cyprus, Erdoğan said Turkey wanted to reach a mutual resolution regarding the problems in the island with Greece. Before Erdoğan, President Celal Bayar was the last Turkish head of state to pay an official visit to Greece in November 1952. Earlier that year, King Paul and Queen Frederica also visited Turkey. Erdoğan, who last visited Greece as prime minister in 2010, was invited by Pavlopoulos to pay a two-day visit. The president also met with Prime Minister Alexis Tsipras and ethnic Turks in the Western Thrace as part of his visit as president. In the joint news conference, Tsipras said that Greece wants to start a new chapter in Turkish-Greek relations in 2018. He noted that they agreed to launch discussions on confidence building measures with Turkey. President Erdoğan touched upon a number of issues in his speech, including the status of ethnic Turks in Western Thrace, Gülenist Terror Group (FETÖ)-linked fugitives, and the resolution of Cyprus issue. "Serious improvements have to be made regarding the status of minority, ethnic Turks in Western Thrace" Erdoğan said, and noted that while the average GDP per capita in Greece is 15,000 euros, in Western Thrace the figure is around 2,000 to 2,200 euros. Erdoğan also said that he told Mr. Tsipras that justice delayed is justice denied over the extradition of FETÖ terror suspects in Greece, who attempted to topple the democracy and killed 251 people on July 15, 2016. The president noted that it was the Greek Cypriot side who left the recent peace talks in Geneva. "We do not have any patience left over the Cyprus dispute" Erdoğan said, adding that Turkey seeks a just and permanent solution to the issue but the Greek Cypriots do not want that. Turkey and Greece established a High-Level Cooperation Council in 2010, which was last held in Izmir in March 2016 when Tsipras and Prime Minister Binali Yıldırım signed 54 cooperation agreements. The next council meeting is expected to be held in Thessaloniki, Greece. Erdoğan expects to discuss future cooperation in areas such as counter-terrorism, trade, transport, energy, tourism, culture, Cyprus, migration. Issues affecting minorities in both countries, Turkey's relationship with the EU are also due to be mentioned. The extradition of putschist soldiers who fled to Greece after the failed July 15, 2016 coup attempt is another issue that is expected to be discussed during the visit. Greece's 2015 general election saw four Turkish-Greek lawmakers return to parliament. Three deputies — Ayhan Karayusuf, Mustafa Mustafa, Hüseyin Zeybek — represent Tsipras's Syriza coalition. Syriza came first in Rhodope, Western Thrace, which is home to a significant Turkish community. Ilhan Ahmet, of The River party, was elected in the Western Thrace's Xanthi. Three planned projects will boost economic, transport ties between the two neighbors. One focuses on passenger and goods ferries between Izmir and Thessaloniki. Another is a high-speed rail link between Istanbul and Thessaloniki. Meanwhile the third is the construction of a river bridge between Kipoi in Greece and Turkey's Ipsala. According to the Turkish Central Bank, direct investment from Greece to Turkey was $6.9 billion between 2002 and August 2017. Turkish investment in Greece was $200 million in the same period. The trade volume between the two countries fell by 47 percent in four years to $2.6 billion in 2016, down from $4.9 billion in 2012, according to the Turkish Statistical Institute. The decline was mainly due to the drop in Greek exports, which fell 66.5 percent to $1.2 billion, while Turkish exports to Greece rose 1.8 percent to $1.4 billion. Turkey is the fourth largest market for Greek exports, and the 12th largest importer to the Greek market. Prime Minister Yıldırım, Economy Minister Nihat Zeybekci and Transport Minister Ahmet Arslan had paid working visits to Athens in June. Greek-born Deputy Prime Minister Hakan Çavuşoğlu visited the country in November, when he met ethnic Turks in Komotini, his hometown. Pavlopoulos attended the Black Sea Economic Cooperation in Istanbul in May to mark the organization's 25th anniversary. Greek Economy Minister Dimitri Papadimitriou attended the Aegean Economic Forum in Izmir in October. Also in October, Greece's Foreign Minister Nikos Kotzias paid a working visit to Ankara.